Maddie is still home sick. We went to the doctor today and she has strep. 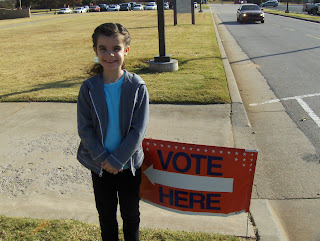 So...she GOT to go vote with me. We were prepared for a long wait. We packed a backpack full of books and a throw up bucket! Well, the Lord was good to us and we got right in and we were out within 20 minutes! Boy have I heard stories of long lines and long waits! 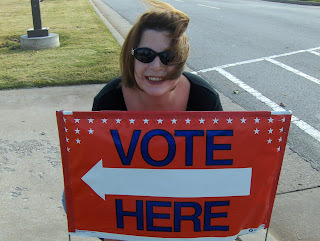 But, what a privilege we have as Americans to be able to have the right to vote. Today is a day that will go down in history no matter who wins. I'm praying that the Lord's good and perfect will be done. It's exciting and scary all at the same time. I'm praying for a President who believes in our country, has served our country and who believes in the sanctity of life. For me it boiled down to one issue. The right to live...when I've said that before I've had people tell me I'm full of hate. Wha...? I think it's more hateful to kill an unborn baby. Sometimes I just don't get it. I know some of you who read this blog have different political views and that's great. That's what America is about being able to believe how we want. People have fought and died to give us that right. I'm grateful to be an American. This post is not to get you upset it's simply me documenting a piece of history for my family. Please don't leave hateful comments if you don't agree with me, after all this is my blog. Thanks for respecting my right to express my thoughts on my blog. Hey girl, Love the pics. I feel your candy wrapper pain. Go check out my blog. I gave you a super shout out at the end.